A FIRST batch of undocumentedFilipino residents in Bahrain have legalised their stay, thanks to financial support provided by their own government.Manila has agreed to pay a substantial contribution towards their flexible work permits, which were launched by Bahrain’s Labour Market Regulatory Authority (LMRA) last year. Thirty Filipinos were signed up to the scheme yesterday at the LMRA’s Sitra branch, meaning they can sponsor themselves and work on a freelance basis. The Philippine Embassy will pay the BD449 flexible work permit application fee on their behalf, as well as a recurring monthly fee of BD30 for the first two months and a BD5 registration charge. 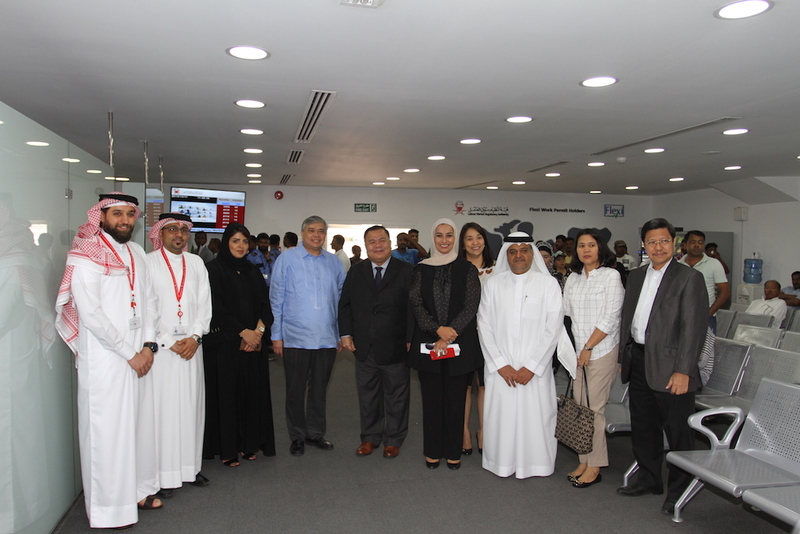 “Bahrain has offered a pathway for workers to regularise stay by being sponsor-less with medical benefits and a ticket back home because of the flexible work permit,” Philippine Ambassador Alfonso Ver told the GDN yesterday. The diplomat accompanied the first batch of 30 illegal Filipino workers as they registered – and said more would soon apply. “We have a manageable number of irregular workers who are now thrown a lifeline by our government, which will enable skilled workers to be employable in Bahrain,” he added. The GDN reported yesterday that there were around 60,000 Filipinos in Bahrain, of whom an estimated 2,200 were undocumented. Around 1,300 are eligible for the LMRA’s flexible work permit, but Mr Ver said many had been put off by the registration fees. “We have given a lifeline to Filipinos in Bahrain by paying the initial application fees and two monthly payments, following which the worker has to pay for the permit,” he said. The permits are valid for two years, after which point they must be renewed, and come with a residence permit. They were launched in July last year and allows illegal expatriates with expired or terminated work permits to sponsor themselves. “This is a lifesaver and free gift for skilled workers to integrate and contribute to the local workforce,” Mr Ver said about his government’s support of the scheme. He urged illegal Filipinos to contact the embassy or check if they are eligible for the scheme by sending their CPR numbers via text to 33150150, or by visiting the website lmra.bh. Over two years the flexible work permits cost a total of BD1,169, including a BD200 work visa, BD144 healthcare fee, a BD30 monthly fee and a one-time deposit of BD90 to ensure travel tickets can be refunded in case recipients wish to return home. There is also a one-time BD15 discounted fee to be paid by a person whose residency has expired. However, domestic workers and those with travel bans or court cases are not eligible. When the scheme was launched last year authorities said they intended to issue 48,000 permits until 2019, generating as much as BD56 million that would otherwise have gone into the illegal visa black market – in which expats shell out as much as BD1,500 to buy two-year residence permits. This entry was posted in Gulf Daily News and tagged flexi permit, Philippine Ambassador by Labour Market Regulatory Authority. Bookmark the permalink.